This spacious apartment with stunning, panoramic views is situated on the top floor of an attractive typical Savoie alpine chalet. It offers non obstructive views to the entire Haute Tarentaise valley, including the Mont Blanc Massif, Bourg-Saint-Maurice city ensuring you a true "zen" feeling both when you wake up as when you arrive after a nice day of skiing or hiking! It is located in the village of Les Coches, in the heart of the vast Paradiski area (425km of slopes) and is great for both winter and summer holidays. Les Coches is known as "Montchavin La Plagne" since 2016 and truly the center of the ski domains La Plagne, Les Arcs and Peisey-Vallandry. It is the perfect starting base for a mountain excursion in either direction! Only 250m from the first lift, the apartment is close to all the village amenities, yet enjoys peace and quiet, resulting in a beautiful Alpine retreat. The spacious apartment sleeps 6 adults comfortably. Sleeping areas include one larger bedroom (a king-sized bed with en-suite facilities), a twin bedroom, and the use of a quality and comfortable fold out sofa bed. The accommodation features a spacious living room with high vaulted ceiling, connected to the dining area with authentic wooden Savoie chairs and a fully equipped kitchen. The living area provides comfortable sofas and a flat screen television with a DVD player and satellite TV. The kitchen allows you to cook a real meal (! ), offers a microwave, separate large oven and a full-size dishwasher. The apartment has a large family bathroom, a separate toilet and one bedroom has a separate bathroom with shower and sink. The apartment benefits from high-vaulted, beamed ceilings giving an additional feeling of space, you never have the idea you actually are in an apartment! The french windows that lead from the living area onto the large balcony provide panoramic views and give a superb backdrop to your stay. Enjoy extended panoramic sights, or the classic "mer de nuages" (sea of clouds) only true unobstructed mountain views can offer you! The apartment is part of the "Les Chalets de Wengen" residence, providing the added benefit of access to an on-site indoor swimming pool (free) and Spa facility including jacuzzi, sauna and steam room. Yet thanks to the fact it is located in an isolated chalet means you do not have the classic "buzz" of a ski complex. Add to that the fact you are on a top floor and you know you have enough privacy. The reception in the main building has an open fireplace, comfortable seating, complimentary tea and coffee, pool table, free Wi-Fi. There is free car parking right outside of the apartment. Fresh bread, croissants and "pain au chocolat" can be ordered at the reception and are available the next morning for collection. Free trolleys are available from Reception for arrival and departure days. I'm Julie and I live in Belgium. I fluently speak Dutch, English and also have good knowledge of French. With a busy job in the Pharmaceutical sector and 2 young kids, I try to balance my busy live by travelling to the mountains as much as possible: during summer for the nature and hikes and in the winter season for outdoor skiing and just being in the mountains! It was love at first sight with the apartment: the spacious living room with wooden ceiling, large balcony and amazing views. The location is excellent: very close to the ski lifts but still in a quiet area to enjoy silent stay. With two young kids this is important! This property is excellent for winter holiday (skiing, snowboarding,...) and summer (hiking, cycling,...). Les Coches is a beautiful village with a character and linked to a very big skiing area. It is like being in a rural area without the disadvantages, yet having the vast ski areas at close proximity! The excellent view to the Haute Tarentaise valley and mountains, the quiet but central implantation and the very "village" like surroundings without being too isolated! The bathroom with bath and shower is a separate family bathroom with heated towel rack, comfortable setting. The first bathroom is linked to a private bedroom and has a shower and sink, heated towel rack and provides enough space and privacy. There is a separate toilet in the hallway. A washing machine is available in the Chalets de Wengen main building. A tumble dryer is available in the Chalets de Wengen main building. There is free Wi-Fi access in the reception. All towels are provided, with the exception of beach towels for the swimming pool. Nice and cosy living room with plenty of space, television, DVD player, satellite TV. The high beamed ceiling and high windows provide a very spacious experience! The kitchen is fully equiped and has all dishes and utensils at your disposal. The dining area is part of the living area and kitchen and provides space for 6 adults. Furniture is classic wooden authentic Savoie furniture. We also provide a child highchair for the little ones! Satellite TV is provided with a wide range of both International and local stations. A variety of books is available in the reception area. You can enjoy a game of pool in the reception area..
We offer a DVD library with a variety of movies, from comedy, more romantic to cartoons and animation movies for children. The apartment has a large balcony of 10 m², with stunning views on the Tarentaise valley, Mont Blanc Massif, Bourg-Saint-Maurice. Imagine yourself as a spectator of an Alpine train diorama! Bicycle renting in Les Coches villa. Enjoy snow biking in winter or Enduro and Downhill mountainbiking in summer. You are in the center of the Paradiski area (425km of skiing fun!). The apartment has a ski locker at your disposal at the main floor. Some shops also offer services to store ski equipment. Les Arcs provides a beautiful Golf terrain in summer. Unfortunately due to the stair to the top floor where the apartment is located, access by wheelchair is not possible. Free. Details available from reception. Our majority of guests return delighted from their holiday for a variety of reasons. 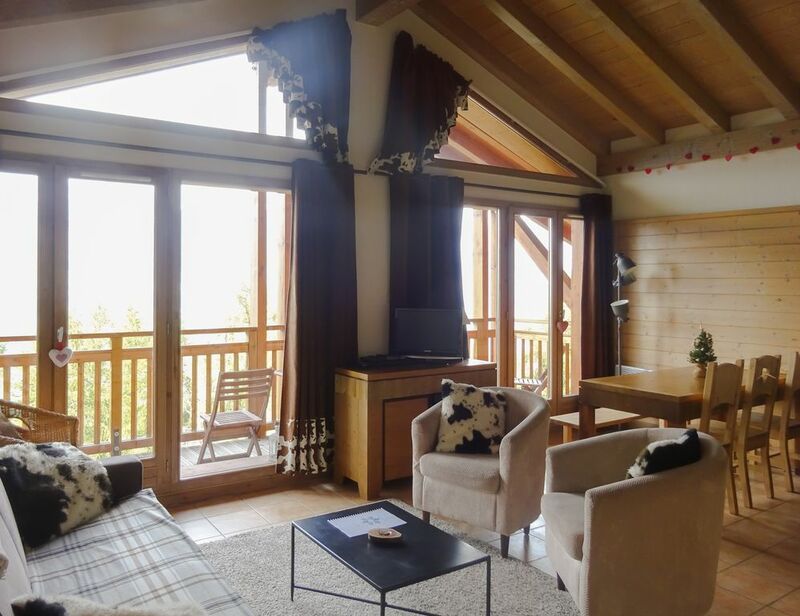 Most recurring comments include the wonderful view of the balcony, the spacious feeling and the fact you're on the "top floor" of a chalet which provides a unique roomy ski holiday experience unlike most classic apartments in ski domains. Our apartment gives you a "feel at home" vibe in winter after a busy day of skiing, or provides ultimate relaxation for the not-so-into skiing home stayers. In summertime it is the perfect starting base for mountain hikes, mountainbike trips and exploration of the area, Vanoise national park, Tarentaise valley and Bourg-Saint-Maurice area. The famous Col du Petit Saint Bernard and Lac du Roselend are but 30 minutes by car! We had a very good holiday in this luxury apartment. It had a perfect location with an amazing view. Very close to the shops and slopes, but quiet location with no noice. Relaxing with a marvelous view! It was our second stay in 'les Coches' during last week of August. The apartment is very cosy and relaxing. In 'Les Coches' are plenty of shops open so that one does not always need to go to Bourg St Maurice for daily shopping. A perfect location for mountain walks. In the apartment was a lot of information for tips for trips and in the kitchen we found everything available for those who want to cook. Unfortunately the pre stay clean was missed, but the owner contacted us to apologise and to refund the value of the clean so no harm was done. TV remote control was missing, again no real hardship. Apartment has great views and is well equipped. would recommend hiring a ski locker in Les Coches to save walking up and down with skies each day. Shower in apartment quite weak but hot. WiFi is an extra payable in apartment along with parking, expected to be included. Thank you very much for your honest review. Our apologies for the cleaning error, this is the first time this has ever happened! As for the TV remote it has been discovered, all be it in non-functional form, it will be replaced by a new one. As for the WiFi, we are checking with Chalets de Wengen how we can improve the infrastructure but it is a challenge to set up in mountain areas. Modern, spacious, quiet apartment with stunning views down to Borg St Maurice and Landry, with a short walk to ski lifts in the best area to access both La Plagne and Les Arcs quickly. Thank you very much for your kind review. We are glad to hear you enjoyed your stay in the Alps and hope you had a wonderful ski experience! We enjoyed our holiday with 2 small children in the beautiful apartment. It is a really cosy and comfortable apartment with all facilities included. The apartment has a suberb view over the valley on mountain too! Thank you for your positive review. Les Coches offers excellent winter holiday fun even for the littlest, hope you tried the Children Club as well, it is really to be recommended! Les Coches is ski station with very classic "village" feel, situated in the center of the Montchavin La Plagne ski domain, which is part of the huge Paradiski area with over 425 km of slopes. Skiing is possible in La Plagne, Les Coches, Peisey-Vallandry, Les Arcs! During winter there are plenty of activities from winter hikes with (or without) snow shoes, to snowboard fun in half pipes, off-piste skiing and ski touring or just relaxing on the slopes in one of the many chalet restaurants. The apartment is located in the center of the Les Coches station and has some excellent restaurants, a local butcher, bakery and supermarket as well as animation and entertainment for families. Thanks to the "Famille Plus" label, the village is enjoyable for families with children and a not the "typical" noisy French "après ski" villages, making it an excellent base for a truly relaxing winter holiday. For the skiing die hards, you can ski from Les Coches to La Plagne or from Les Coches to Peisey-Vallandry and the vast Les Arcs domain, thanks to the Vanoise Express liaison, and back (we do it a couple of times, it provides literally miles of skiing fun!). Non-skiing activities are diverse and include dog sledding, snow shoeing, paragliding, walking excursions with guides, cinema (Montchavin), and discothèque for nightlife (Montchavin). In other words something for everybody, every age! Not known by many, but Les Coches also makes a wonderful summer holiday destination for lovers of nature, hiking, mountainbike and outdoors. During July and August the village has a nice and relaxed atmosphere. With very nice forests, mountain lakes and peaks just a hike away it is one of the more interesting summer alternatives for the nature enthusiast. The Vanoise National Parc (known for its wonderful and remote nature, Alpine Ibex and protected landscapes) is at close proximity and the famous GR5 trail runs straight thru the area. If you rather fancy mountain lakes, the Lac La Plagne is within hiking reach, as well as the wonderful Champagny area. We highly recommend the region, both in winter, as well as summer seasons! Not including travel or transfers. Beds made upon arrival, bed linen and towels included in rental price. Final clean (except kitchen) included in rental price.